Ignore the rust, ignore the primer. 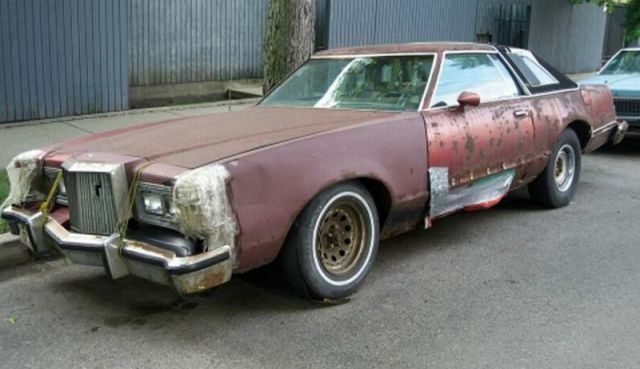 The duct tape AND fiberglass tapeworms give this gas-guzzling lolmobile immediate qualifications as a genuine candidate. Say we ignore that awesomeness – the bungie bumper supports are a stand alone double-whammy for inclusion in the esteemed category known around these parts as Babe Magnets. Congrats are in order. This entry was posted on Monday, 17 October 2011 at 12:05 AM and is filed under Automotive, Babe Magnet, Cool, Douche Baggage, Humor, Odd, Retro, Stupid. You can follow any responses to this entry through the RSS 2.0 feed. You can leave a response, or trackback from your own site. That looks like the perfect first car for my son. He’ll be too busy keeping the bumper on and won’t have time for the babes. Calo– Be sure to tell your son’s girlfriend not to be his hood ornament, holding the bungie cords. Too dangerous. I suggest you volunteer. I’d like to buy that in a couple of years. plane– In a couple of years they’ll pay YOU to buy it.